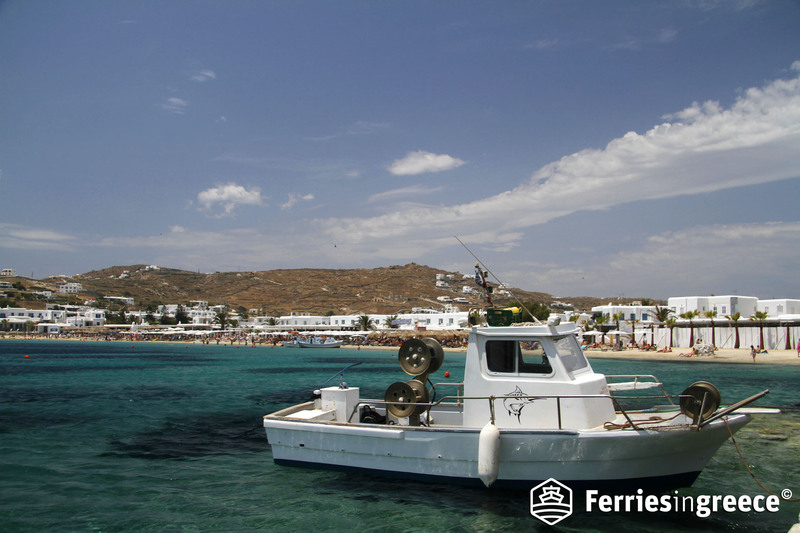 Mykonos is considered one of the most popular Greek Islands due to the amazing nightlife and its cosmopolitan character. Each year, more and more tourists visit the “Island of Winds” in order to party in the local clubs which are reasonably compared to those of Ibiza. If you decide to spend your holidays on Mykonos, you will admire the magnificent landscape of the Cyclades or several well-known Mykonian landmarks, such as the Windmills and Petros, the Pelican. 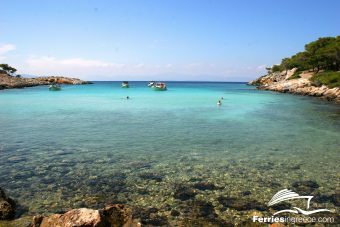 But most of all, you will dive in some of the most elegant beaches of the Aegean Sea! 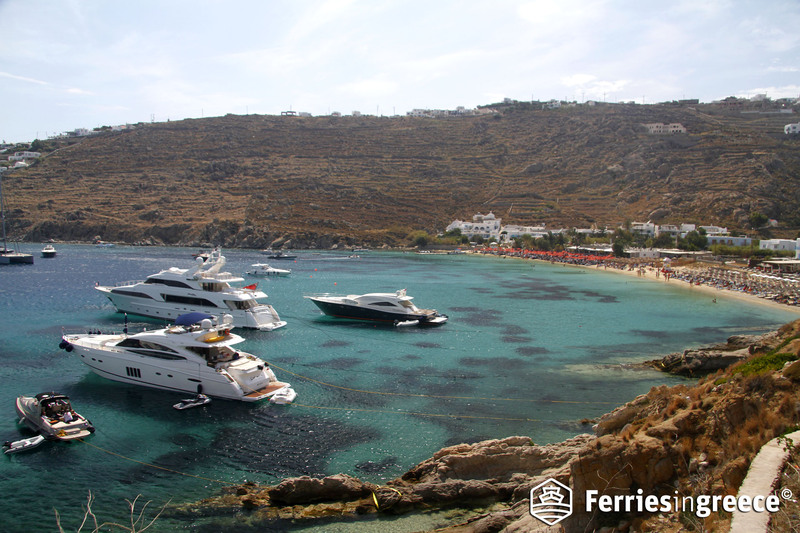 You can easily visit this beautiful island by ferry from the Ports of Piraeus, Lavrio or Rafina. If you book your ticket, do not forget to swim in the following 5 beaches. 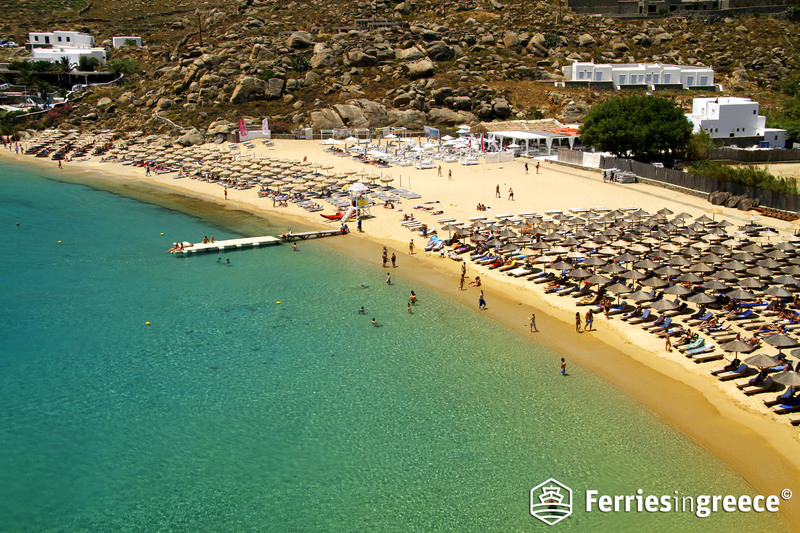 Super Paradise is a beach that you simply can’t miss in Mykonos. It is a local “paradise” because of the blue waters and its golden sand, and of course thanks to the non-stop music and parties that are organized each summer. 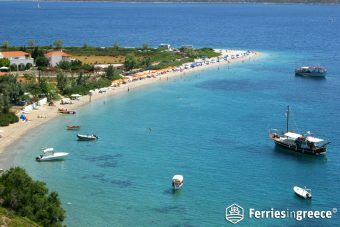 7 km away from Chora, Super Paradise is easily accessible by bus, taxi boat or car. This beach is visited by various celebrities from June until August, so do not wonder if you encounter them next to you or if you see some paparazzi nearby. Also, it’s a gay-friendly beach that attracts many visitors, however, it can be very crowded too. 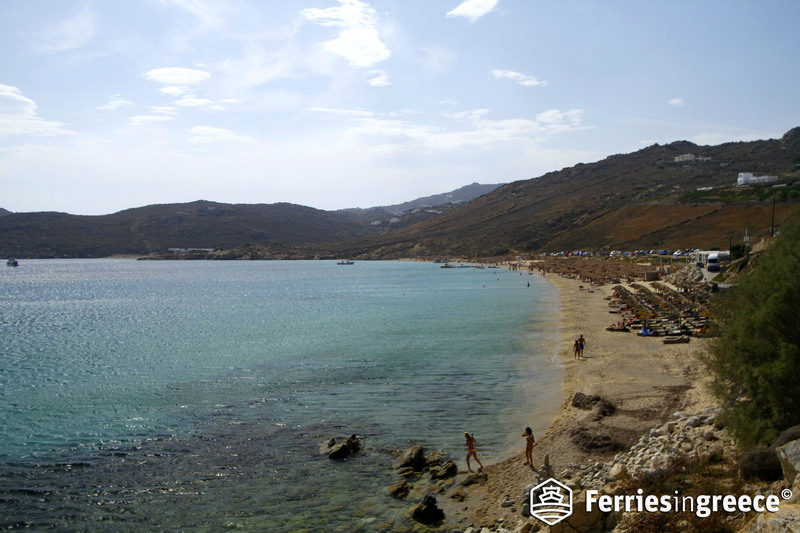 On the South part of Mykonos, Elia Beach offers a gorgeous view of the Aegean Sea and of Naxos Island. It is a big, sandy beach equipped with umbrellas and sunbeds to rent. Elia is far quieter than Super Paradise, but it is also gay and naturist friendly. In Elia there are a lot of water sports available, while around you can stay in some of the local hotels or eat at the restaurants. If you go to Elia Beach by car, note that there is a big parking lot within a short distance. 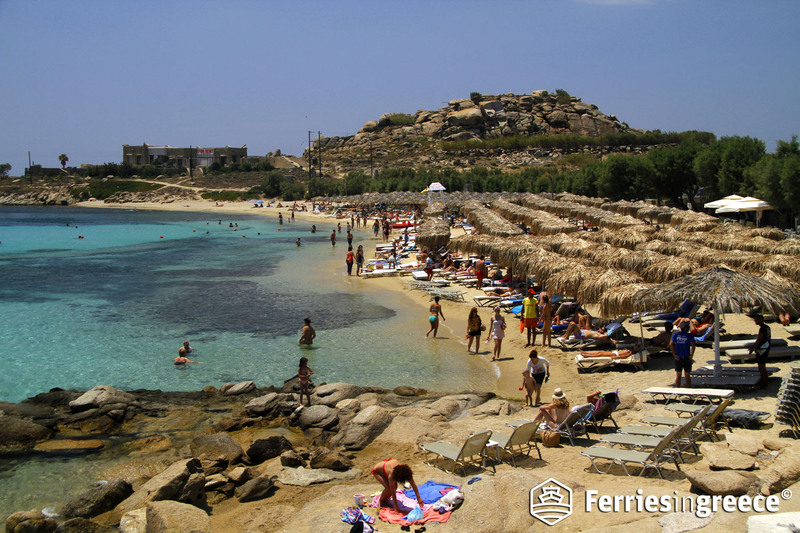 If you are looking for a beach near Mykonos Town, then Ornos Beach is the ideal choice. Only 3 km away from Town, Ornos is a fully organized beach with white sand, crystal blue waters and protected from the local winds because it is located in a gulf. Consequently, it is a perfect beach for parents with young children that wish to enjoy the sea, yet it can be a little crowded during peak season. When you visit Ornos Beach, you can practice water sports or participate in diving lessons. 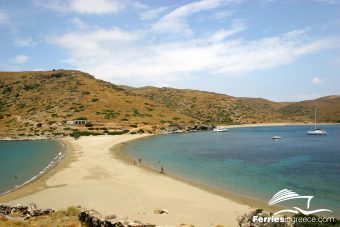 You can access the beach either by bus or car, however, keep in mind that in the beach there is a bay for trips to Delos Island. So, you could combine a short trip to Delos too. Psarrou is a VIP beach or at least well-known for the celebrities that visit it each year. Music, cocktails and cameras form part of the “Psarrou Beach experience”, so be ready to dance, drink and take a selfie. Some people might also feel like a celebrity themselves… Psarrou has beautiful yet shallow waters and is located 4 km away from Chora. If you plan to go there, you should make a sunbed reservation but note that the prices are extremely high. Close to Psarrou Beach there are several hotels, rooms to rent, beach bars, water sport activities and diving center. Some travelers might seek an alternative beach, that is quieter than Psarrou or Super Paradise. If you belong to this category of travelers, Paraga Beach is ideal for you; the crystal clear waters, the combination of white sand and small pebbles, the picturesque landscape of the caiques and the view to Delos will definitely captivate you. Actually, Paraga is formed by two different beaches (the north one if organized) and is located within a distance of 6.5 km from Chora. The main landmark of Paraga Beach is the big rock in the middle of the sea, so you can climb it or take some photos from up there. Close to Paraga, you can stay at the camping or at any other hotel. Moreover, you can choose among several beach bars and tavernas. This beach is gay-friendly too and if you have time to spare, you can rent a taxi boat to visit Super Paradise from Paraga.